Linda L. Piff, a respected lawyer and blogger in New Jersey, writes in her blog, reproduced below, that Collaborative Practice is far more cost effective than litigation. Although most family law cases do eventually settle, they do so on the court house steps after most of the damage of litigation has occurred. The inflammatory court papers have been filed and become a public record, large sums of money have been spent on litigation and the children become victims of the divorce process. Collaborative divorce in a relatively new concept for New Jersey. It was approved by the Supreme Court as a way for parties to divorce on December 5, 2005. While relatively new, collaborative practitioners are experiencing a demand for this way to divorce. In a collaborative case, the parties agree not to litigate from the onset. Unlike mediation, which uses a neutral as the only professional in the dispute resolution process, in a collaborative case each party is represented by an attorney. The value for clients is that they avoid the damage that is done through litigation and save the expense of the lengthy court room battle. What can be said with confidence is that no other kind of professional conflict resolution assistance is consistently as efficient or economical as collaborative law for as broad a range of clients. While the cost of attorney fees cannot be predicted accurately, a rule of thumb is that collaborative law representation will cost from one-third to one-half as much as being represented conventionally by a lawyer who takes issues in your case to court. Our experience in Ontario is the same. Collaborative practice is a far more efficient and cost-effective way of getting through your divorce. Sitting Next to Each Other in Divorce Proceedings? “Alex Crookes knew he was in for a divorce with a difference the minute he walked into a lawyer’s office with his ex-wife, Lynne Maclennan. The couple instinctively sat at opposite sides of the table, until one of their lawyers, trained in the relatively new concept of collaborative family law, set a more comfortable tone for the talks. I can’t say I actually insist that clients sit next to each other during four way meetings but I certainly do my best to help them understand that they should be working from the same side of the table – figuratively speaking. What I mean by that is that clients sometimes think that divorce has to be a battle. I try to help them realize that they actually share the problems with their spouse, everyone wants to resolve the issues and they can work together to find a resolution that works for both of them. Court is a battle. Each side is supposed to show the strengths of their own position and the weakness of the other. The judge is then asked to choose between the two sides or do his/her best to come up with a just resolution. Often neither party is happy with the results and the costs can be staggering. 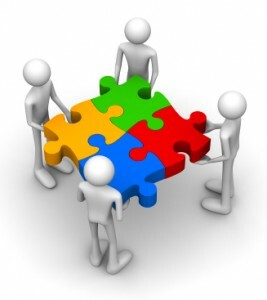 In the Collaborative process, the clients work together to find a mutually acceptable agreement. The power to make decisions stays with the clients instead being given to the judge. The International Association of Collaborative Professionals has an excellent description of the Collaborative process. I won’t ask you to sit next to your spouse in the Collaborative process but I like the way this Toronto lawyer is thinking. How Does Collaborative Team Practice Work? Collaborative Team Practice (CTP) is a revolutionary new way of resolving issues related to your separation and divorce without going to court. In CTP, a team of professionals works with you and your spouse to find the best possible outcome for your entire family. You stay in control of the process and the outcome. You find win-win, long-lasting solutions. It’s private, cost-effective, efficient and dignified. It works. 1. In a CTP negotiation, both parties’ lawyers act as facilitators for constructive communication. They provide legal advice so you know the range of outcome at court and they ensure a legally binding agreement is produced. 2. Before negotiations begin, both parties and their lawyers must sign a “Participation Agreement” that commits them to reach a settlement without going to Court. The agreement also requires both parties to make a full and honest disclosure of all financial and relevant information. 3. If you or your spouse decide to withdraw, or if a lawyer discovers that important information is being withheld, both lawyers are required to withdraw from the case. No other lawyer from the firm can represent the client. This provides a very strong incentive for both parties and their lawyers to negotiate in good faith. 4. Each party works with a Divorce Coach to assist in dealing with the emotional journey inherent to separation and in developing communication and post-separation strategies. 5. A Financial Advisor is jointly retained to assist the parties to collect the relevant financial information and to explore settlement options. 6. Lastly, a Child Specialist will meet with the children and help the parents develop a parenting plan that is in the best interests of the children. 7. This process may, at first, sound more expensive, but in reality it is much cheaper than the Court process and is usually less expensive than negotiations between two lawyers. Why? When working through the financial issues you will be sharing the cost of one Financial Advisor rather than each paying for your own lawyers to do the same work. Likewise, you will share the cost of the Child Specialist instead of having to both retain experts. The Divorce Coach will help you keep the emotional issues from sabotaging or prolonging the negotiations, saving you hundreds or even thousands of dollars in legal fees. 8. If you get stuck in the negotiations, you can resolve the issue by arbitration and continue with the negotiation process for the other issues. CTP just makes sense. You get the help you need rather than spending your time, money and energy on fighting. In other words, you are getting a team of experts working to find the best solution for the whole family rather than each of you assembling a band of warriors focused on waging war against your spouse. In addition to saving you money, CTP will result in a better settlement: a win – win solution. As a result, you and your spouse will likely be able to preserve your relationship with one another. Perhaps hard to believe, but it’s true. This leads to a much more healthy situation for the children’s sake.